Hugh's epilepsy has been a major factor in his life for as long as I can remember. His first obvious seizure happened at around 10 months but it's highly likely he was having seizures before this; he was already undergoing investigations for epilepsy due to the fact he was losing skills and regressing in some areas of his development and his brain MRI had flagged up that seizures would be highly likely. Truth be told, I suspect he had his first epileptic seizure in the womb, although I didn't know that was what it was at the time. Hugh's had 5 or 6 EEGs, two brain MRIs and tried numerous anti-epileptic drugs with limited degrees of success. I've lost count of the number of ambulance rides he's had- somewhere between 20 and 40 I'd guess, and nights spent in hospital must be well into triple figures. He's stopped breathing more times than I'd care to remember; I stopped counting the amount of times I'd resuscitated him when we hit 100 a few years back. Yes, epilepsy has certainly been a huge and unwelcome factor in Hugh's life. Epilepsy is the thing that stops us living life to the full. It limits where we go and who we see. Hugh can't visit his family in Ireland because it's not safe to fly or get the ferry. He always needs to be within quick, almost immediate, access of trained medical support. Where we live we are less than 7 minutes in an ambulance from the hospital and the ambulance usually get to us in well under 10 minutes. That's the kind of immediate assistance Hugh needs. He hasn't got time for the aeroplane to land or the air ambulance to get him off a ferry. Travelling abroad, even just across the Irish Sea, just isn't safe. For a while, Hugh couldn't even leave the house, his seizures were so frequent. It was safer to keep him at home, with quick access to the oxygen and his medication. As much as I'd love to say that Hugh's disabilities don't hold him back, that he lives life to the full, the truth is, his epilepsy significantly reduces his ability to get the most out of life. When the epilepsy diagnosis came, I assumed it would easily be controlled and that life would return to normal. Instead I discovered that 30% of people never control their epilepsy through drugs. After 6 or 7 different anti-epileptics, months and months of increasing, reducing and trying different combinations of those drugs, we admitted Hugh was in the category 'medically intractable'- the drugs don't work. We tried the ketogenic diet next and the success of this was astounding; within weeks his seizures drastically reduced. We started going out as a family again, we even managed a holiday to Wales, things that were impossible when his seizures were at their peak. During this time, we tried unsuccessfully to weanhim off the drug phenobarbital, but after a hospital admission where he stopped breathing for 16 minutes, we decided the risks weren't worth it and he remained on the diet and drug combined. Over the course of the three years that Hugh was on the ketogenic diet, more seizures started to creep in. The gap between the severe, life threatening not -breathing type remained a steady 3 months or so (sometimes slightly longer), but he began having daily seizures and clusters of seizures too, though these rarely required medical intervention. Yet we successfully weaned Hugh off the ketogenic diet in 2015 with no increase in his seizures. 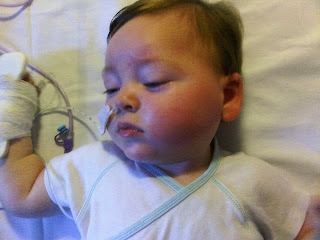 Hugh still isn't completely seizure free though, so we have continued to look for alternatives. Three months between life threatening seizures isn’t great, but it is manageable and better than how we lived pre-ketogenic diet. Plus the daily seizures appear to cause no real ill-effects, so far as we can tell. Lately, however, his seizures have become so severe that it is increasingly difficult to resuscitate him. In March he went for nearly 6 minutes without oxygen as a result. The potential consequences of this could have been devastating and we were exceptionally lucky that Hugh made a full recovery. It is a risk that we really do not want to face again. Hugh’s neurologist agrees. A brain MRI showed that he wasn't eligible for brain surgery since no single area of his brain is responsible for the seizures. 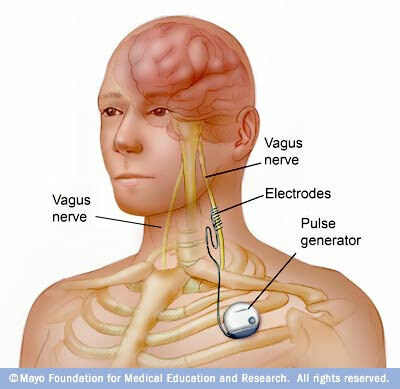 So our only hope, Hugh’s final hope, is to try Vagus Nerve Stimulation. Vagus Nerve Stimulation (VNS) is a treatment for epilepsy where a small device is implanted under the skin below the left collar bone. This device, similar to a pace-maker, is called a generator. The generator is connected to a thin wire, which stimulates the vagus nerve in the person’s neck at regular times throughout the day. This sends impulses to the brain, which helps to prevent electrical activity that causes seizures. We’ve been told about a third of patients see significant improvements, a third some improvement and a third it makes no difference at all. Side effects, other than those associated with a general anaesthetic are apparently minimal and include intermittent hoarseness and difficulty swallowing while the device is sending electrical impulses. Hugh has been approved for this treatment and is currently on a waiting list for surgery, which will be in approximately 4-6 months. We’ve heard lots of positive things about VNS and are hopeful that it will help Hugh, I don’t really want to consider the alternative. In the meantime, we’ll just hope and pray that we can keep him safe and manage his seizures when they come.